These cold, cloudy winter days have me dreaming of lovely Spring days. 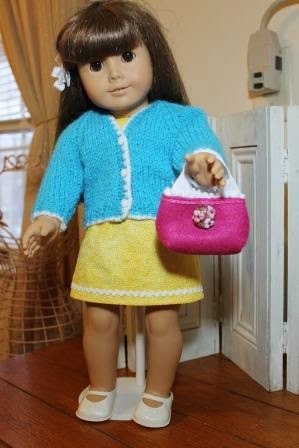 This outfit is a new one for my American girl doll. I display my dolls and their handmade clothes each summer at a local library and I wanted to make some new outfits. The dress is from Simplicity pattern #0107. A plain shift that is made of just a front and back. Double fold bias tape is used at the armholes and neckline. I used a zipper instead of velcro for the back closure. A cream colored baby rick rack (.25 inches wide) from Wrights trims the hemline. The sweater was a pleasure to knit. The pattern is from a Plymouth Yarn book that is out of print. It is called Dolly Mixture. The yarn is Plymouth Encore DK. 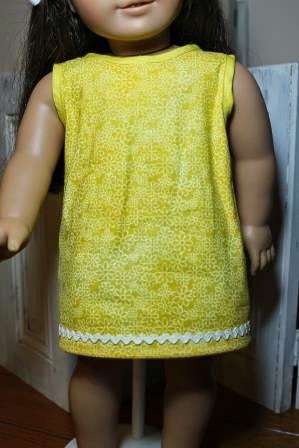 One of my favorites for doll clothes. 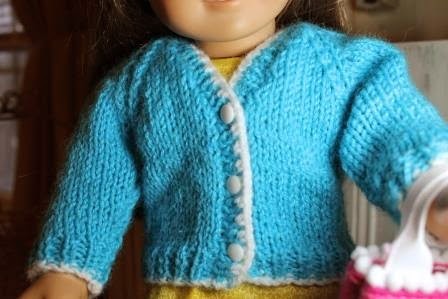 I cast on with the white and continued to knit with the turquoise. The buttons are 3/8 inch white by Blumenthal. The purse was fun to make. 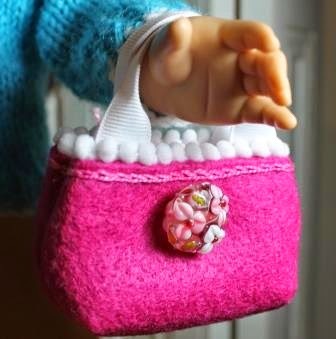 I used felt and the purse from Simplicity pattern #A2108 another out of print pattern. I found this several years ago at a Florida Walmart. I sewed it by hand using embroidery floss. The bead is from my travels. I think the colors really compliment the outfit. I really enjoyed sewing the purse. I’m going to look at my other outfits and make purses for those too.